Washington dispatched Minnesota 5-2 Sunday at Husky Softball Stadium to win the NCAA softball Seattle Regional and advance to the Super Regional where they’ll face Alabama next weekend. It took two pitchers, several timely hits from the top of the lineup, smart baserunning and one final head’s-up defensive play on the last out, but the fifth-ranked Washington softball team beat Minnesota 5-2 Sunday afternoon at Husky Softball Stadium to advance to the NCAA Super Regional round. The Huskies’ win sets up an intriguing rematch against 12th-ranked Alabama (36-18), which UW holds a 2-0 edge against this season. The fifth-seeded Huskies (47-8) are making their eighth appearance in the Super Regional in nine years and will host for the third time in as many years. But the biggest development of this game was the return of pitcher Taran Alvelo, who, until Sunday, had not started a game since UW’s defeat to Oregon on April 27. The Huskies started Gabbie Plain at pitcher in the two games leading up to Sunday’s regional final because Alvelo, their junior ace, has been dealing with a back issue. 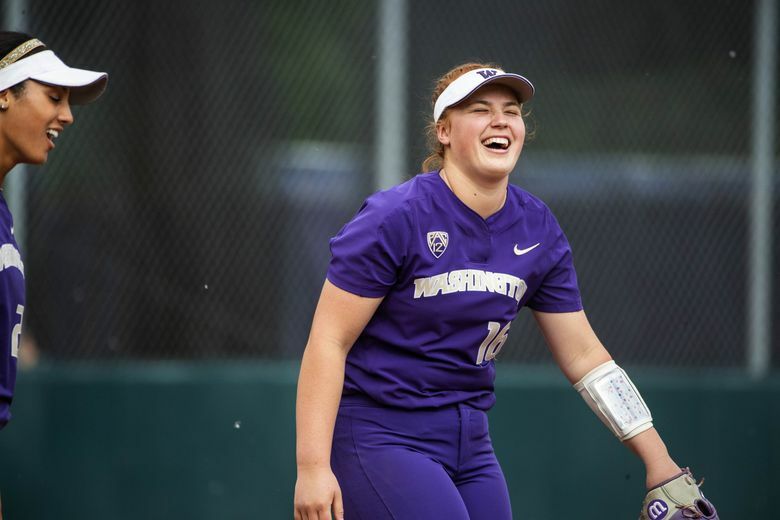 But with the goal of getting to the Women’s College World Series, the Huskies wanted to pitch Alvelo at least once this weekend to set her up well for the rest of the postseason. So Alvelo started. As expected after such a long layoff, she was shaky at first, giving up a double, walking one Gophers batter and hitting the next to load the bases. The Huskies defense bailed Alvelo out of that jam with a well-fielded ball from Taylor Van Zee. Alvelo struck out two straight to begin the second inning, with the first strikeout giving her 220 for the season — the most by a Husky pitcher since Danielle Lawrie in 2010. But once again, she struggled to get the third out, though the UW defense also compounded things with a fielding error that allowed Minnesota to score and go up 1-0. Alvelo gave up two more hits — a single in the third and a leadoff double in the fourth — before the Huskies pulled her. So out came Alvelo, who gave up four hits and two runs. In went Plain, who changed the tenor of the game by forcing Minnesota to adapt to her different pitching style. She struck out six of the first 10 batters she faced, improved her record to 19-4 and was later named the Most Outstanding Pitcher of the Seattle Regional. Plain retired the Gophers in order in the fifth and sixth, but Minnesota tried to mount a late comeback in the seventh. As Minnesota’s Sydney Dwyer — the potential tying run with two runners on base and two outs — sent a hard-rolling grounder toward third base, Van Zee read the ball and dove. But she went the wrong way. No matter. The ball rolled past her and into the waiting glove of shortstop Sis Bates, who scooped it up and twirled it to first for the final out. “I was trying to do anything I could,” Van Zee said. “I thought it might bleed through the five-six hole, so all my momentum was going (that way). The duo was potent at the plate for UW, too. Van Zee went 3 for 4 with a run scored and a run batted in, while Bates went 3 for 3, scoring on an intelligent baserunning decision in the fifth that gave the Huskies a two-run lead. Trailing Minnesota 2-1 in the top of the fifth, Trysten Melhart got on base with a leadoff single and advanced to second on Kelly Burdick’s sacrifice bunt. With Van Zee’s big bat at the plate, Melhart got to third on a wild pitch before Van Zee sent her home on an RBI single. Van Zee then got to second on a single from Bates. Julia DePonte’s double down the third-base line brought Van Zee around to score the go-ahead run that made it 3-2 and gave UW its first lead of the game. Bates, now on third, looked eager to come home. Kirstyn Thomas sent a chopper back to the pitcher and Bates astutely read the situation, waited for the pitcher to throw to first, then made a break for it, sliding safely into home plate to give UW a 4-2 lead.